If coming home leaves a sour taste in your mouth when you see the front face of your house, then you need to make a change. The garage door is large enough to have a profound impact on a home’s curb appeal yet small enough to be easily repainted, making it the perfect place to start your home’s facelift. Here’s how you can plan and execute this simple DIY home improvement project. Before you throw on one splash of paint, you should plan the job from start to finish. The first step is to determine what type of garage door you have, as you’ll have to use different supplies and techniques depending on whether it’s a pre-finished steel or a wood door. Next, determine the type of paint and color that you’ll be using. If you’re unsure of the type, most paint stores have specialists ready to point you in the right direction. Finally, pick a time when you will have at least an hour of free time so you can do the job properly. Schedule two hours if you intend to do complicated coloring or if the surface of the door has significant rusting or paint chipping. When you paint over rust or uneven paint, imperfections in the surface of the new coat cause it to settle improperly and become more vulnerable to damage from the elements. To avoid this fate, take your sanding material and clean up the current coat. Be careful not to sand too heavily or you’ll damage the actual door material. Wipe down the door with rags afterward to remove dust particles. Put down a coat of appropriately selected primer and let it dry. 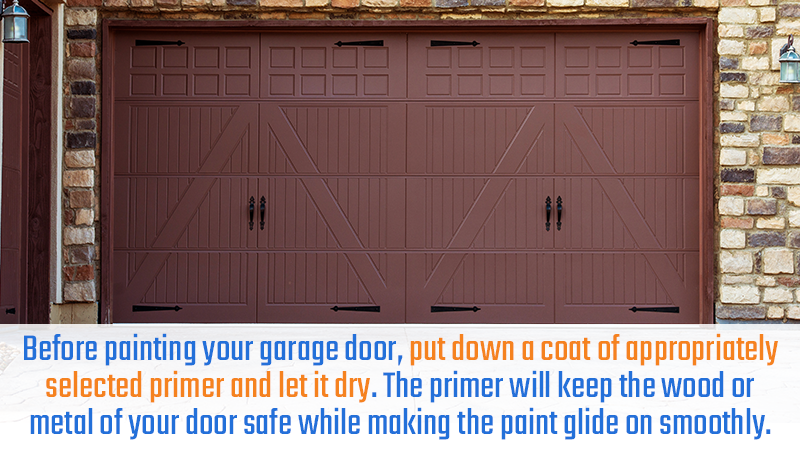 The primer will keep the wood or metal of your door safe while helping the paint glide on smoothly. Begin painting from top to bottom, raising the door up as you go to get at the spaces hidden on top or bottom of the panels. Once you finish the primary color coat, you can stop and clean up unless you want to add accents or trim coloring. Use the masking tape to section off where you’ll be adding highlights and feel free to add in personalized designs. More tips delivered straight to your inbox. Subscribe! 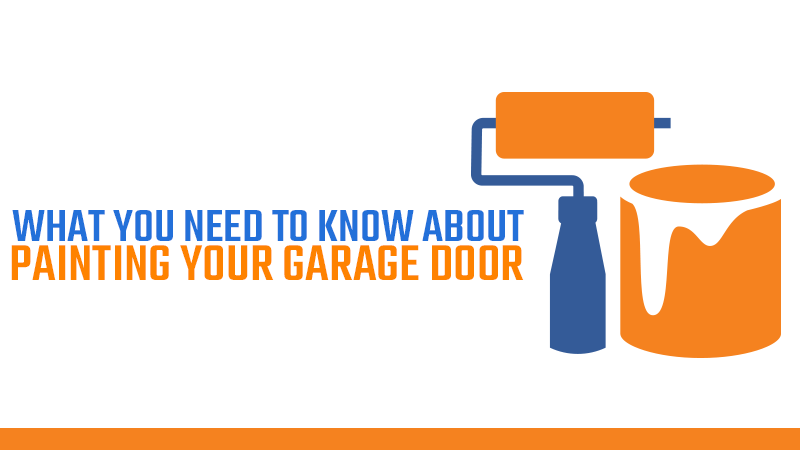 Does Your Garage Need More than a Paint Job? No color scheme can fix a poorly performing door with a style that clashes with the rest of your home. If the new coat of paint doesn’t fix your home’s visage, then call for a free consultation on replacement options from an experienced and tested garage door service company like ACS Overhead Doors. ©2019 ACS Overhead Doors LLC All Rights Reserved.